When all hell breaks loose, the last thing you need is your FR garment adding to the chaos. That’s why we make FR garments that solve problems, not create them. For example, ASC's Wind Pro® FR delivers performance above and beyond FR protection. Like exceptional breathability. A high warmth-to-weight ratio. And 4x more wind resistance than traditional fleece. It even sheds rain and snow should the weather turn. Plus, Wind Pro® FR is constructed with fibers that are lightweight and inherently flame resistant. So you can take comfort even in times that offer none. Performance FR fabrics that are both wind resistant and highly breathable. ASC's Wind Pro® FR sweatshirts are extremely breathable yet provide 4 times more wind resistance than traditional fleece. 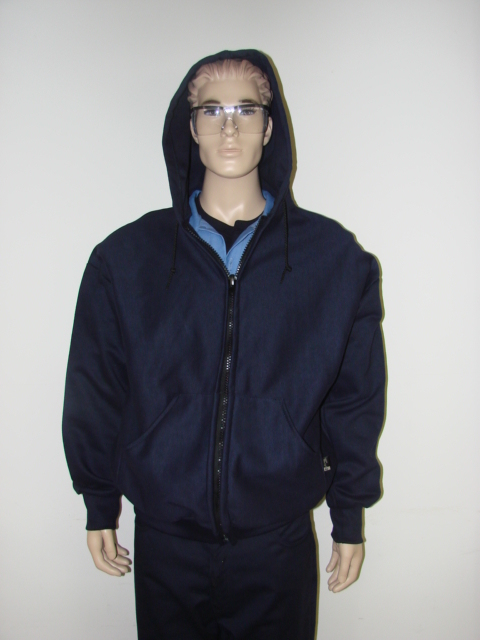 This is the new "super fleece" that spans an incredibly wide range of conditions; provides HRC 2 arc flash protection, performs as both outerwear and insulation; and offers exceptional durability. This is a versatile fabric that can be worn all year long for a variety of activities, from working outdoors up in the buckets to under the streets working in vaults. Proprietary yarns and a very tight construction greatly reduce the effects of windchill, the Achilles heel of traditional fleece. We have proven its effectiveness both in the lab and in the field. ASC's Wind Pro® blocks the wind 4x more than traditional fleece. Because it is not a laminate, ASC's Wind Pro® is also highly breathable, maintaining 85% of the breathability of traditional fleece to keep you from overheating. While wind blows right through traditional fabric, Polartec® Wind Pro® FR provides 4x as much protection and remains breathable.